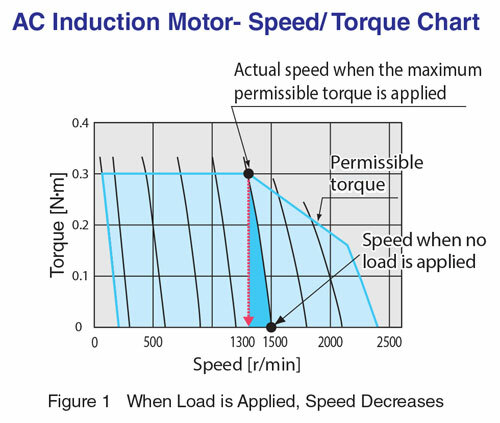 When it comes to speed control, you may think the choice is between an inverter driven three-phase motor or servo motor, but did you know that brushless DC motors specialize in speed control? The brushless DC motor is growing in popularity in the world of speed control. However, not everyone is familiar with the power and performance to cost aspects of the brushless DC motor. Even in usage situations where it has demonstrated its capabilities, it tends to lag behind the two leading players, the inverter driven three-phase motor and the servo motor. 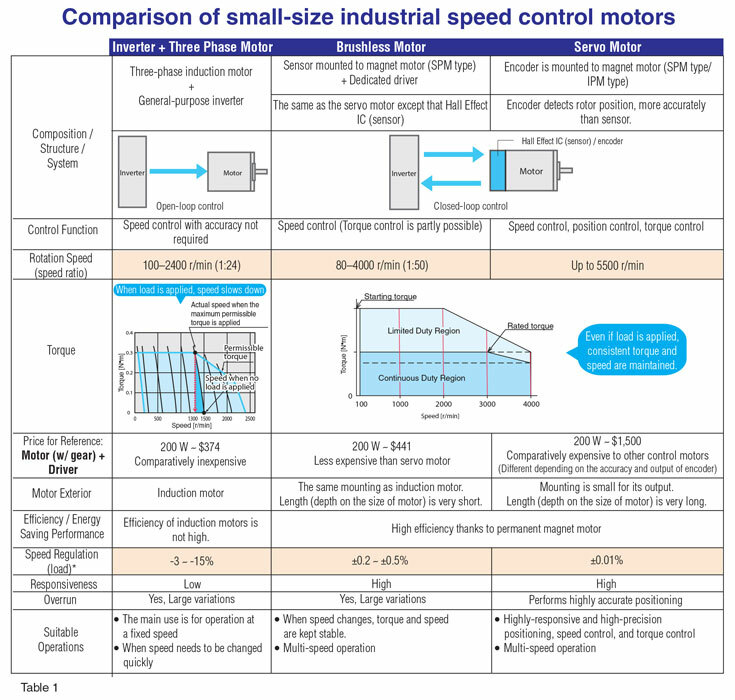 This article introduces the capability of brushless DC motors, as well as points to consider when choosing a compact speed control motor. Inverter or servo motor: Which should be used to control speed? When it comes to speed control, the common choice is a three-phase induction motor that controls speed by use of a general-purpose inverter. For many, this may be the natural choice because it allows you to freely set a temporary driving speed that you can change in the future. Indeed, the inverter is commonly used, but does it actually meet basic needs or solve common complaints? 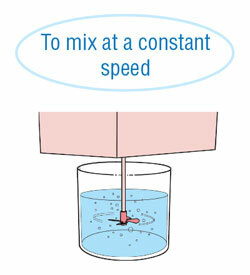 Is it convenient to change the speed every time the task (weight or viscosity) changes? 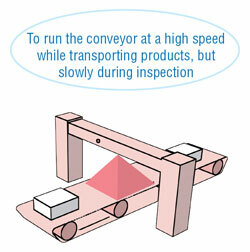 What happens if you want to run the conveyor at high speed while transporting products, and then at a low speed during inspection? When synchronizing the speed of more than two conveyor lines, the speed must be adjusted can this operation be done simply? If speed, torque, or improved controls are needed, upgrading to a servo motor is certainly an option. 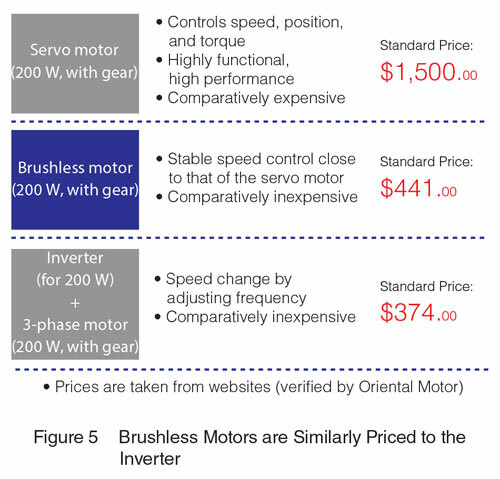 However, considering the relatively low cost of the inverter driven three-phase motor, by changing to a servo motor you will face the problem of increasing expenditure. The servo motor stabilizes speed and solves the problem of synchronization of multiple conveyors, but taking cost into consideration, compromises in your setup would almost certainly be necessary. Is there any product which is easy to use and which does not lead to increased costs? In fact, there is an effective third alternative. The brushless DC motor is similar in structure to a servo motor, however specifically designed for speed control. The position of the brushless DC motor is, in simple terms, between the inverter and the servo motor. It is a motor dedicated to speed control that controls speed as effectively as a servo motor for a lower price, closer to that of an inverter. Let us explain more. Most AC induction motor inverters do not communicate with the motor, however recently with additional encoders or analog signal devices added separately to the motor or moving parts, this is becoming an option. The drawback is the additional costs and tuning to a typically low cost solution. The majority of today's inverters still run open loop. Under the open-loop system, when the load changes, the actual speed does not follow the command. This is why the speed changes (slower when more load is added) and depending on the load, why speed synchronization over multiple axes is difficult. 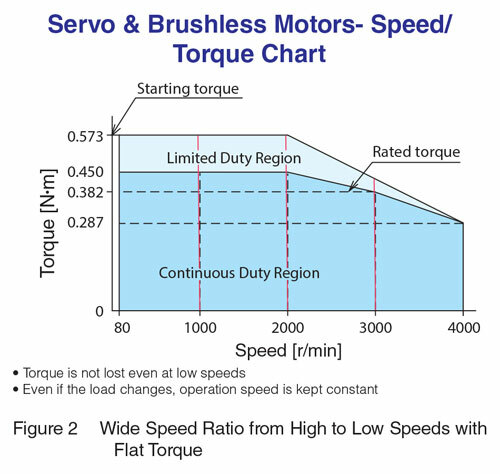 Also, because torque is lower in an AC motor at high or low speeds from rated speed, which is an inherent torque characteristic of the three-phase motor, it is difficult to obtain both the speed and torque you want at the same time. 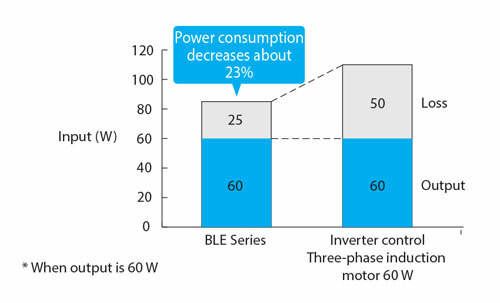 The inverter is effective when the operation continues at a fixed speed, but it is not ideal for multi-speed operations. Heat is also a common component to AC induction motors. To combat this a cooling fan is attached to the back of the motor. Due to the AC induction motors design, heat rises when the motor runs slow and the cooling fan is runs slower. Inversely, when the motor is running at high speed, heat from the windings is also increasing. 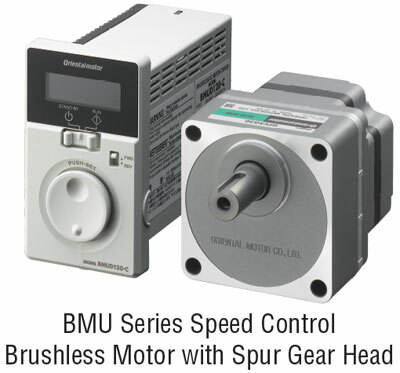 Both the servo motor and the brushless DC motor adopt a PM motor (permanent magnet is used for the rotor) and come standard with closed-loop speed control, where the motors operation status is fed back to the driver. This ensures the motor speed remains constant at the commanded level and enables the speed of two motor axes to be synchronized. 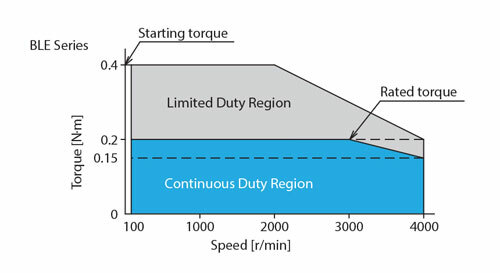 Additionally, flat torque is produced whether operating at high or low speed. 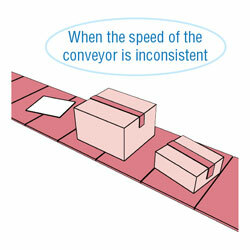 Even if the load changes, at whatever speed is commanded, stable driving speed is ensured. This means these two motors are highly effective in situations in which the inverter struggles. Needless to say, the servo motor is different from the brushless DC motor. Generally speaking, the difference is that one is capable of high performance and all around speed control, while the other is dedicated solely to speed control. 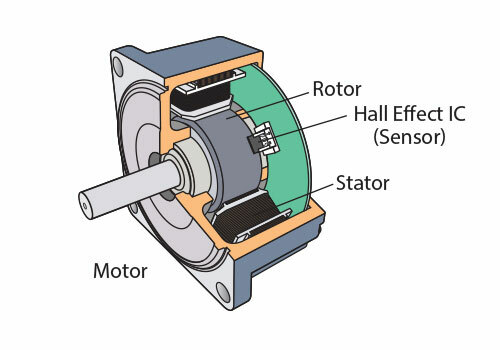 In the servo motor, an encoder is mounted to the motor, making highly precise and accurate position, speed, and torque control possible. It is a highly efficient all-round motor. An accurate encoder is a very expensive part of the motor, although this depends on the encoders resolution capability. As for the brushless DC motor, its function focuses on speed control. If position control is not necessary, speed can be controlled with sufficient accuracy by a Hall Effect IC (sensor). Hall Effect ICs are simpler and less expensive than encoders. In short, since they specialize in speed control, brushless DC motors cost much less than the all-round servo motor. This is the same for a speed reducer (gear head) a vital component of conveyor lines. In the brushless DC motor, the standardized spur gear, which is small and in many situations the same as that used with the three-phase motor, can be used. In the case of the servo motor, which is able to perform high-accuracy positioning and high-precision speed, reducers (gear head) with the planetary gear mechanism are commonly employed. This naturally increases the cost of the motor. Highly accurate speed control at a reasonable price is not the only advantage of the speed control brushless DC motor. Compared with the inverter controlled three-phase motor, the brushless DC motor is thinner and features higher torque. Since a permanent magnet is used in the rotor, the motor is thinner and features higher power. Compared with a three-phase induction motor with a frame size of 3.54 in. (90 mm), a brushless DC motor of the same specifications is 3.31 in. (84 mm) shorter and offers 1.3 times more output power. This compact motor structure allows you to downsize your equipment. Since the brushless DC motor is dedicated to speed control, it can be used right away without going through the parameter setup or adjustment which is required for inverters and servo motors, saving time and effort. Brushless DC motor drivers are commonly available in AC or DC voltage input. This allows for greater design flexibility. For example, if a machine is used in many different countries where power input is different from country to country, a DC input is the desired choice, or if 24-48 VDC battery input is required. If simple AC input is required, whether 115 VAC or 220-230 VAC single or three phase, these common input voltage drivers are available. Brushless DC motor drivers also tend to be very simple to interface with, staying true to the motor concept of no tuning. Controlling speed can be as simple as turning a speed potentiometer or as friendly as analog 0-10 VDC from a PLC or host system. Many brushless DC motor drivers are now coming with built in communication, allowing for common platform network communications to be an option. 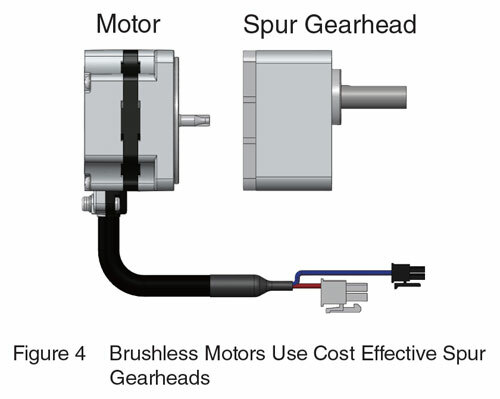 While we briefly touched on this earlier, a significant advantage to the brushless DC motor offering is the use of lower cost spur reducer (gear heads). Because there is no high precision positioning required or the need for expensive bearings to handle moment loads or high thrust loads, brushless DC motors commonly use the same type of gears found on the AC induction motor. This allows for easy upgrading and requires no maintenance. As reducing space, especially on conveyor lines is important, using parallel spur reducers is common. Where more torque may be required, new hollow shaft flat spur reducers are available, increasing the permissible torque significantly. We have put together a summary (Table 1) that compares these three technologies in a simple to understand format. 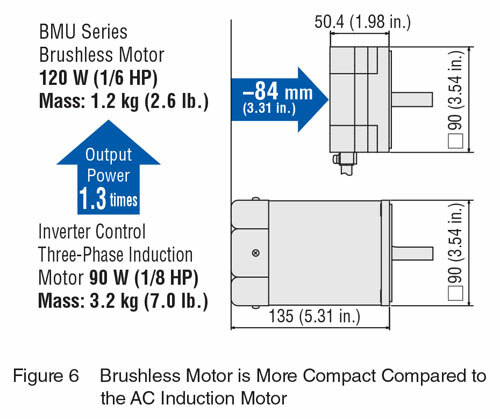 We have also included a review of the brushless DC motor advantages called Five minute guide to the basics of brushless DC motors. In summary, while brushless DC motors are not new to the market, their advantages are becoming better well known as more and more OEM are selecting brushless DC motors over AC induction motors with inverters. 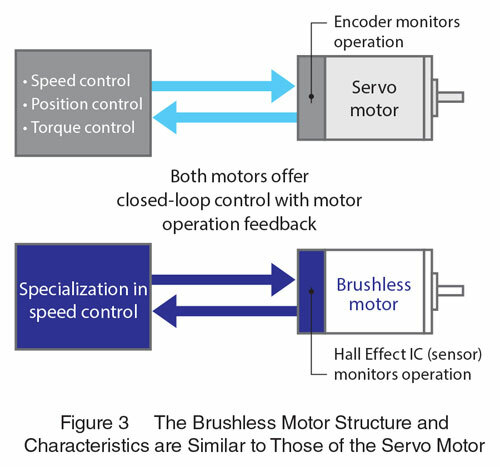 While servo motors offer many performance functions, if speed control is all that is required, brushless DC motors are worth evaluating. 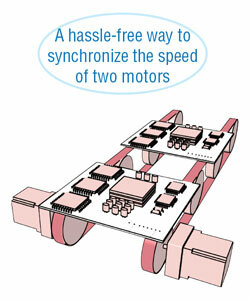 The brushless DC motor controls speed in a closed-loop system. Based on the signal detected by the Hall Effect IC (sensor) mounted to the motor, the transistor in the drive circuit turns on and off, and the motor rotates. It is generally called a brushless DC motor. This name reflects the background of the way it was created the mechanical contact between the brush and commutator, which was a weak point of the DC motor, was replaced by electrical treatment, and maintenance became unnecessary. Constantly comparing the setup speed and the speed feedback signal from the motor, it adjusts voltage applied to the motor. Even if the load changes, it is capable of maintaining stable operation from high to low speeds. Compared with the inverter-controlled three-phase motor, the brushless DC motor is thinner and features higher torque. Since a permanent magnet is used in the rotor, the motor is thinner and features higher power. The speed control covers a wider range than the inverter. When the three-phase induction motor is driven by the inverter, torque becomes restricted at low speeds. With no restrictions, the brushless DC motor is suitable for situations where a constant amount of torque is required from high to low speeds. A permanent magnet is used for the rotor of the brushless DC motor to eliminate secondary loss. Compared with an inverter-controlled three-phase induction motor*, it reduces power consumption by about 23%, contributing to energy efficiency. 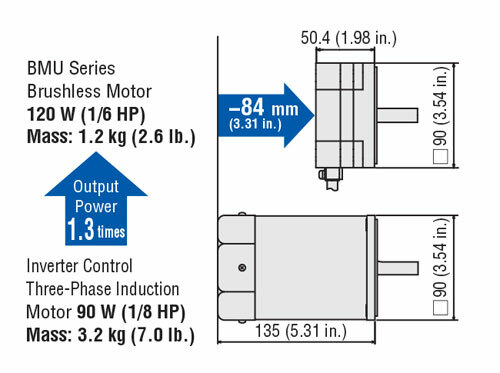 In our AC input series, with the box-type circuit serving as the base, the following types of brushless DC motors are available: one allows the speed to be set with a built-in potentiometer and one connects to Factory Automation (FA) networks. In our DC input series, there is a motor with a circuit substrate.